“Road tax is a thing of the past,” says Mitsubishi in its new TV ad, which first aired last night. Well, yes, that’s accurate. But the use of the phrase in the TV ad isn’t meant to mean “road tax” is dead but that there’s a vehicle that doesn’t have to pay it. 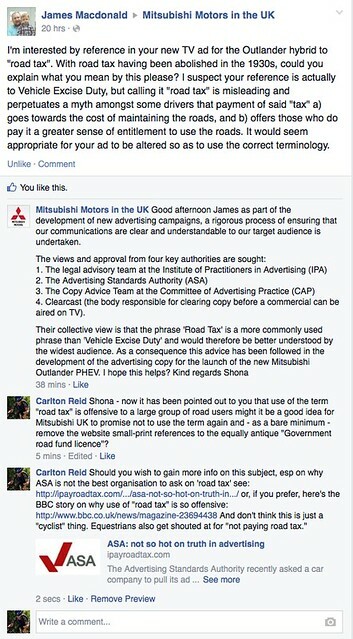 Interestingly, Mitsubishi UK have revealed in a Facebook conversation that they sought official views on the use of the offensive and inaccurate term “road tax”. The company checked with trhe legal advisory team at the Institute of Practitioners in Advertising (IPA), the Advertising Standards Authority (ASA), the copy advice team at the Committee of Advertising Practice (CAP), and Clearcast (the body responsible for clearing copy before a commercial can be aired on TV). “Their collective view is that the phrase ‘Road Tax’ is a more commonly used phrase than ‘Vehicle Excise Duty’ and would therefore be better understood by the widest audience. As a consequence this advice has been followed in the development of the advertising copy for the launch of the new Mitsubishi Outlander PHEV,” said Shona of Mitsubishi. However, ASA is a serial offender here, always refusing to tackle advertisers on this subject. Thing is, “car tax” is also a widely used and understood phrase. Why don’t car advertisers switch to that? That’s the term used by many official bodies. “Vehicle tax” is also used. DVLA, the Post Office, the AA, and many other organisations get the terminology right, why do car manufacturers find this so difficult? Small print on the Mitsubishi website mentions the “Government road fund licence”. Like “road tax”, this was abolished in 1937. This entry was posted on Tuesday, May 27th, 2014 at 8:31 am	and is filed under No such thing as road tax!. You can follow any responses to this entry through the RSS 2.0 feed.